Southeast Alaska's comfortable maritime climate means cool summers and mild winters. The temperate marine climate of Southeast Alaska is created by the nearness of the North Pacific Ocean and the steep coastal mountains on shore. The ocean warms the area in the winter and cools it in the summer creating a moderate climate that goes against the stereotype of Alaska's weather. The average summer temperature is about 65 degrees in July. Sunny days can occasionally push the thermometer into the 70s and 80s. Winter brings mixed snow, rain, and sunshine with a January mean temperature of 24 degrees. The first snowfalls often occur in late October but, generally, there is little snow accumulation at low levels until late November. Southeast Alaska's maritime climate is characterized by relatively mild, cloudy, wet weather. Along the inside coast from Juneau to Ketchikan about 50% of the days have measurable rainfall. However, the rain is seldom heavy enough to cancel outdoor activities. It's common to see people holding picnics or participating in sporting activities in the light rains. There's no hiding the fact that Southeast is damp. Juneau gets about 70 inches of "damp" a year, Ketchikan averages about 160 inches, and Skagway, which is in Glacier Bay's rain shadow, averages 27 inches. This precipitation also arrives as snow. 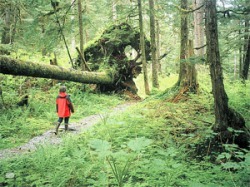 More than 100 inches a year fall in the mountains behind Juneau. The snow accumulations feed the ice field and glaciers of Southeast Alaska. It also brings happiness to skiers and snow boarders at Eaglecrest, the ski area just 20 minutes from downtown Juneau. It has often been said, "there is no such thing as bad weather, just bad clothing!" Southeast Alaskans have perfected the art of "layering" and take great pride in their frontier fashion sense and hardy nature!